I had my Summer Sizzler Catalogue Launch on this weekend for the Occasions and Sale-A-Bration Catalogue. It was a fun time sharing lots of the gorgeous new products and samples with them. I will share some of the cards I have made over the next couple of weeks. Today I thought I would share with you the little Treat Holders I made for everyone who came to Thank them for coming. These cute little Treat Holders are made using the new Gingham Gala Designer Series Paper stack. The paper is 6″x6″ (15.2cmx15.2cm) and are just the right size for these. I made them in some of the different colours. I took a photo of 3 of the different colour ones. I have also used the lovely Organdy Ribbon that is available as a free choice for Sale-A-Bration. I will tell you how to make them below. To decorate the front of them I stamped one of the butterfly stamps from Butterfly Gala set using Black Memento ink and these were then coloured with the Stampin’ Blends. Using the Butterfly punch makes life a lot easier. No fussy cutting them. 🙂 The sentiment is from the Well Said stamp set. I stamped the “THANKS” on to Whisper White and punched it out with the Classic Label Punch. I then could trim off each end. I find this a much easier way of doing it. 1. Take your 15.2cm x15.2cm (6″x6″) piece of paper. I have used the Gingham Gala Designer Series Paper stack. Line the left hand edge of the paper on the 6.7cm (2 5/8″) mark on the Envelope Punch Board. Punch the paper and score on the score grid of the Punch Board. 2. Turn the paper 90′. Line up the little score tab on the previous score line. Punch and score. Turn the paper another 90′. Line the tab mark on the score line, punch and score. Turn again and repeat. 3. Round the corners using the corner rounder on the punch board. Fold on the score lines. Decide which side you want showing on the outside, place that side facing down when folding. NB: In the photo below I hadn’t turned it over at this point. Fold up the bottom tab. Place adhesive on the 2 outside edges of this tab. I used Snail adhesive. Fold in one side tab and adhere down. Before folding in the other side tab place adhesive on the inside bottom edge of this tab. Fold over and adhere down. Decorate as you like. To add ribbon, punch a hole in the top tab and thread through your ribbon. This is a great size for a Tea Bag packet, chocolate, Gift card or other treat. cards, Catalogues, Classes, Stampin' Up! WISHING YOU WELL MAKE AND TAKE! Since I am sharing cards with the Wishing You Well set lately I thought I should show you this one. This card was one of the cards we made at my Holiday Catalogue Launch a few weeks ago. Everyone liked making this card even though it is fairly simple. We made this on the weekend at a private class too. They all liked it there also. 🙂 (BTW: If you can’t make a class you can book a Private class with me with a couple of friends. They are always a fun time). The layout is based on the Freshly Made Sketches #352 – you can see that here. There was the option to stamp the bow on scrap white paper and cut it out (no Framelits or punch for that sorry!). This was raised up with Dimensionals and that looked good too. The strip of paper is from the Country Lane Designer Series Paper. The sentiment stamped on Crushed Curry was cut with the Bunch of Banners Framelits and we trimmed off one of the ends of the banner. We added a few loops of Silver Thread behind it. To add some colour to the white space the “dots” from Timeless Textures was stamped in several places in Mint Macaron. I made another similar card to this in Christmas colours. Check that out in tomorrow’s post. OPEN HOUSE REVIEW AND A WALK THROUGH VIDEO! I just had a small display of samples but that’s OK. Sometimes it can get a bit overwhelming when people first come along. I will share details of some of the cards I showed in the video over the next few posts but here is just a couple of still photos to share. The Eastern Palace Suite Display. I have shared most of these projects over the last few weeks. Color Theory Suite. I will share more details of these later. Incolor Flower Box using the Delightful Daisy Bundle The box is made using the Wood Crate Thinlits. This was inspired by a Demonstrator on a Facebook group I am on. The centres are the new Gold Faceted Gems. Everyone received a Thank You Gift for coming of a little pack of Incolor ribbon and a bow, some Gold Faceted Gems and a chocolate. It was all gifted in a Wood Crate. The flower is from the Happy Birthday Gorgeous set. Lucky Door Prize for each event was some 6×6″Eastern Medallion paper, Easter Gold Vinyl Stickers and Gold Ribbon. Sorry if you couldn’t make it along. I wanted to share some of the creations with you though. If you are local then try and come along next time. 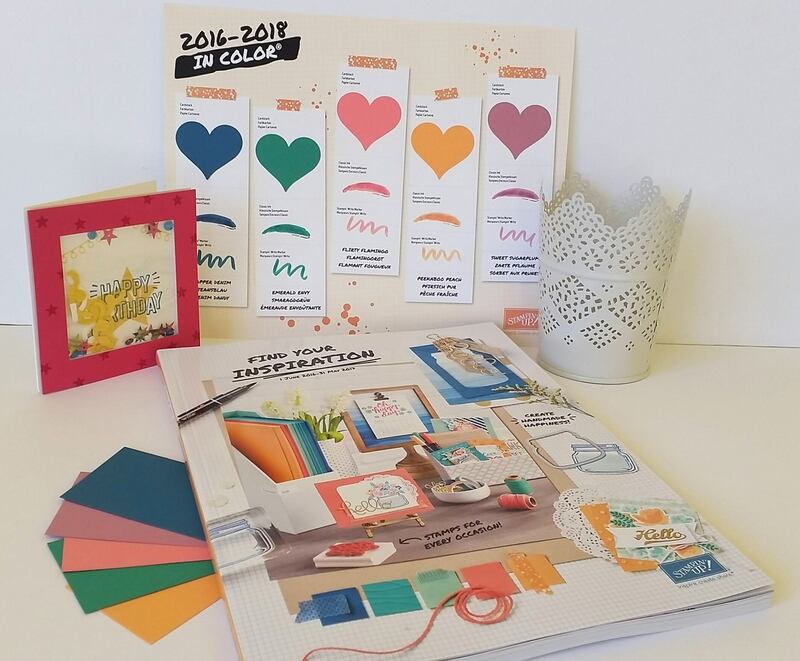 3D projects, cards, Catalogues, Classes, Stampin' Up! Last post I shared some of the creative fun from my Catalogue Reviews held last weekend. I forgot to share one more project. So I guess this gets it’s own little post. With all the busyness leading up to last weekend with creating I was starting to run out of time. So I decided to use this frame I had sitting around for a while and make little samplers of some of the products. It is only simple but was a good way of showing them. Here it is for you to see. I included a sample of some of the papers and the dies and then embellished them. It worked well I think??? The pieces are adhered in each box with glue dots so I can easily remove them and use them on cards. Then I can replace them with products from later catalogues. It’s a simple way of showing off some of the products. Thanks for visiting. I have lots of samples to share that I made for my launch so I will get to share those soon. For those on the East Coast of Australia, keep cool. The weather is heat wave conditions at the moment. I have lost count of how many days in a row it has been now. It’s a bit hard to be creative in this heat I will say. These are very simple little 10cm x 10cm cards (4″x4″). This cute set is a 3 step stamp set. To stamp the bear I used Crumb Cake for the 1st stamp, Soft Suede for the 2nd stamp and stamped off first on scrap paper before I stamped, then Soft Suede for the 3rd stamp, stamping without stamping off. The sentiment is actually 2 stamps. I lined them up together on the clear block and inked the stamp and stamped on scrap paper a few times to test that they were lined up straight. making any adjustments as I needed. Then I stamped them on different scraps of the new Incolor card in Soft Suede ink. The one on the left is Sweet Sugarplum, the middle is Flirty Flamingo and the right one is Peekaboo Peach. I cut the sentiment with the Hearth and Home Thinlits. Before I added them to the card with Dimensionals. I added a little piece of Paper Doily under the bottom edge. These ones are the retired ones. I still have yet to get the new ones. The bows are 2 stamps. I inked the first stamp (the more solid one) in the colour and then stamped it off on scrap paper first before stamping on white card. Then inked the other stamp up and stamped in full strength (without stamping off). I cut these out and raised them up with the Dimensionals. Thanks for visiting. Have a great weekend. STAMPIN’ UP! CATALOGUE LAUNCH – PART 2! I have some more of the fun from my Catalogue Launch for you. If you missed out on the first part then head back to the last post I did. Today I want to share with you some of the stamping fun we had. The table all set up ready to go. I was pretty excited with the Pom Pom Flowers I found that was a fairly close match to some of the new Incolors. This was a sample of some of the new products and some cards. I had other new products in the Product Playground that I showed in the last post. I had some Swirly Bird card samples to share. I have a class this coming Saturday just with the Swirly Bird stamps and the Scribbles Thinlits. That should be a lot of fun. This was the first Make and Take using the new Flourish Thinlits. I love the delicateness of these dies. I found they cut surprisingly easy even with just the regular platform. I used the new ‘Playful Palette’ DSP stack too. The sentiment is from the new set ‘Best Birds’. The other Make and Take was using the new Dapper Denim Incolor. I have used the ‘Thoughful Banners’ stamp set. These banners are so easy to punch with the Duet Banner Punch. I stamped a background on the base card with the Timeless Textures stamp set. The colours of the stripes were from the top – Night of Navy, Dapper Denim, Island Indigo, Marina Mist and Soft Sky. I cut a scallop square mat for the white stamped card piece with the new Layering Square Framelits. It just gives a subtle peek of the silver Foil. This card was inspired by a card I saw on a Facebook group I am on. So lots of fun was had by all my lovely ladies who came. I appreciate each and every one of them. If you are local make sure you come along to my next launch or class to enjoy the fun. I have reviewed the Catalogue Online but now It’s on this Friday and Saturday – The New Catalogue Launch Party at my Place – and you are invited! There are 2 times so if you are a Wollongong local I am sure there will be a time to suit you. Come along and give some new products a test run in the Product playground, make a card or 2, have some games; Lots of fun all around! RSVP: Thursday 16th. Places are filling up fast so don’t delay. 2015 CATALOGUE LAUNCH MAKE AND TAKES! I thought I would show you the Make and Takes we made at my launch last weekend. I shared some of the fun in an earlier post. Firstly, we made a bookmark showing the new Incolors and using the cute new set “Sprinkles of Life”. The top of a strip of Whisper White (5cm x 21cm) was punched with the Scallop Tag Topper Punch. One of the greetings was stamped in Memento Ink at the top. How cute is this saying?? Right at the bottom the cone was stamped in Tip Top Taupe and then each ice-cream scoop stamped in a different colour. There is a matching punch which we could have punched out the scoops but to keep it simple and quick they were just stamped directly on to the card. Everyone could choose their colour of the new Incolor Dotted Lace Trim. Now for the card. I changed my mind a few times with what we do leading up to this. This card was inspired by a few cards I had seen on Pinterest. Once again, each guest could choose their own colour. This is using the set ‘I Think You’re Great’. The scallop lines were stamped in Delightful Dijon (or what they chose). The “hi” cloud was stamped in their matching base card colour and hand cut.The flowers were punched from Watermelon Wonder card using the small flower punch in the Itty Bitty Accent Punch Pack. A little bling and some white twine finished it off. Now of course it’s nice to have a matching envelope. So with the new Envelope paper we could make one using the Envelope Punch Board. LAUNCHING THE OCCASIONS AND SALE-A-BRATION CATALOGUE!! If you are local to East Corrimal then do join us. Do something for yourself this year and take some time out for you! I would love to see you come along. Don’t forget RSVP date February 4th. Book and pay by then to receive your Goodie Bag. Email/comment that you will join us. I had 2 sessions on the day with lots of lovey ladies. Yet I didn’t take a photo of the groups! Not to worry, you can see some of the display. New Product display of colours and ribbon! This is a close-up of the flowers. These flowers were inspired by a display I saw at Convention. Close-uo of the flowers using Moonlight DSP paper Stack and Clear Faceted Buttons. So onwards to tomorrow now. The new Catalogue. Can’t wait!